We are delighted that have chosen to click through to our site because it gives us an opportunity to introduce you to the vibrant Anglican community and its building that is situated in the beautiful south Pennine region of West Yorkshire. Haworth will forever be linked to the literary output of the three daughters of one of our former incumbents, the Rev. Patrick Brontë. He and his family lived in the Parsonage just to the west of the Church building from 1820 until 1861 and the novels produced by Charlotte, Anne and Emily not only still enthral readers throughout the world but attract many visitors to the Church and the village from around the world as well as from Yorkshire, its surrounding counties and the rest of Great Britain and Ireland. All the family but Anne was interred in a tomb beneath the present Church which was rebuilt after Brontë’s death. 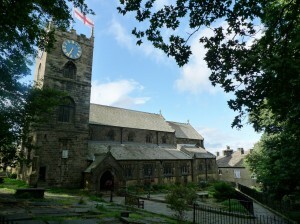 The present Church was constructed between 1879 and 1881 and, although little remains of the previous buildings – parts of the present church tower formed parts of both the medieval church building as well as the one that Brontë would have used – many historical connections with both the Anglican and Methodist movements as well as literature are still present. 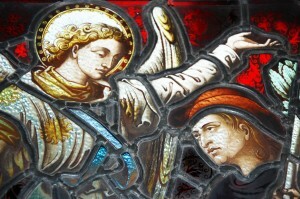 Today, the St Michael and All Angels, together with its associated Church St Gabriel’s in the nearby hill-top village of Stanbury, provides a spiritual centre for the district’s vibrant Anglican community and a great deal of work is going into fulfilling the ambitions of a five-year plan to repair and restore the splendid Haworth Parish Church building that is constructed in the perpendicular style. The first phase of that plan, the repair of the south-facing roofs and restoration of the tower, was completed in 2012 after a two-year fund-raising programme that met the cost of £227,555.00 with the aid of grants by such bodies as English Heritage; the National Churches Trust; All Churches Trust; the Bradford Diocesan Church Buildings Fund and Yorkshire Historic Churches Trust while we were fortunate to receive donations from many other individuals, community groups and interested parties. Members of the congregation have also worked hard to provide around £10,000 from events such as master baking classes, fayres and concerts. Work on the north-facing roofs started in April 2016 and was completed in August 2016. The completion of the second section of our five-year restoration plan was made possible by grant-funding from the Heritage Lottery Fund, Yorkshire Historic Churches Trust and All Churches Trust as well as received donations and the hard-work of the congregation. Simultaneously the Church was made more fit for worship and visiting in the twenty-first Century by the completion of a re-ordering programme at the west end of the building and the north-facing door. At the west end of the Church a toilet suitable for both able-bodied and disabled people together with a modern catering servery was constructed while the previous long-serving wooden vestibule at the north-door was demolished and replaced by a modern glass door with an impressive engraving. These developments will, we hope, enable us to stage more events; entertain our visitors more comfortably and provide our worshipers with a comfortable environment. This work has been made possible with the assistance of grants from the Garfield Weston Foundation, the All-Churches Trust and the Beatrice Laing Trust. The final cost of this second stage of the plan is expected to be in excess of £300,000 by the time the final bills are received. If you also take into consideration the installation of a new, modern heating system within the Church in the winter of 2014 – 2015 that cost more than £60,000, it is possible to see that the Church has made a substantial investment in its own future. Work is also needed at St Gabriel’s in Stanbury where it has been revealed that the roof is need of serious remedial work. Fund-raising has started in earnest to repair the damage and although early grant-aid requests were refused the congregation is determined to succeed in its ambitions. Stanbury Church received a substantial leg-up in their fund-raising with the news that they had been awarded a £33,800 grant by the Government’s List Places of Worship scheme while they have also raised in excess of £12,000 by their own efforts. It is expected that the repair project will be completed in 2016. Working through the rigours of the various grant-provision programmes has ensured Haworth Church’s original five-year restoration plan has had to be amended. It is currently running approximately a year behind what was originally envisaged and we are considering how the plan needs to be amended to take into consideration the ever-changing financial landscape. At Haworth we still have ambitions to clean and restore the wall paintings; improve the lighting and sound systems; develop a small retail outlet; convert the choir vestry into a room that could host a Sunday School and provide glass walls for the Bronte Chapel. While all that work is taking place, the Church continues to serve its community by providing regular services; spiritual support and community activities. Most things that you will need to know about our Church and what it has to offer can be found within this web site. If you cannot find what you need to know then please use the e-mail contact facility to ask your question and we will do our best to get back to you as fast as we can. A vital part of the Haworth Parish is the neighbouring hill-top village of Stanbury where the congregation attend sister Church, St Gabriel’s. This neat Yorkshire-stone building also has part to play in the Bronte legend. Rev. Patrick Bronte initiated the building of a ‘Mission Church / School’ in Stanbury in 1848, the year that both his only son Branwell and daughter Emily both died. Patrick’s curate, Arthur Bell Nicholls, took a particular interest in the project and he oversaw its construction. It is believed that Charlotte taught in the Sunday School at Stanbury Church and in 1854 (with the reluctant agreement of her father) she and Arthur Bell Nicholls were married.